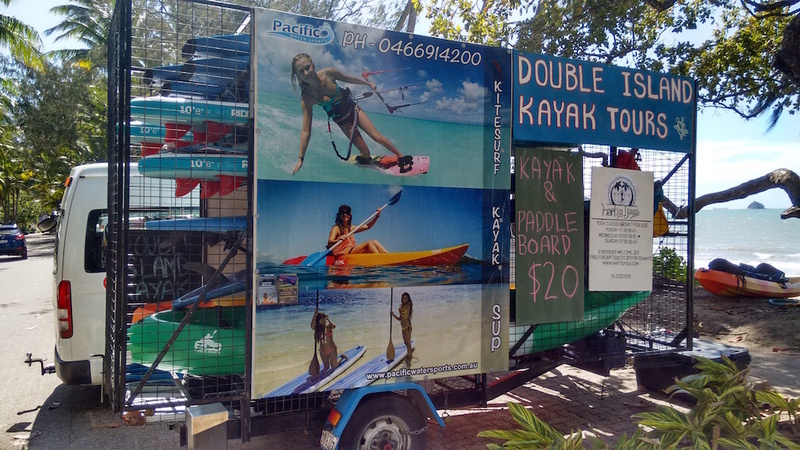 Palm Cove is our central watersports location. We are located right on the waterfront at the south end of Williams Esplanade – 41 Williams Espanade to be exact. You can’t miss finding us. You will see a big trailer with lots of paddleboards and kayaks on it. So check us out. Palm Cove is a beautiful tropical location located 25 minutes north of Cairns. This is the perfect place for relaxing and enjoying the sunshine and tropical atmosphere. Palm Cove is the perfect location for kayaking , standup paddle boarding and kitesurfing in the afternoons once the wind is up. Here at Pacific Watersports we have built up a reputation for supplying quality watersports services. So whether its kayak tours, paddle boarding lessons or kitesurfing, look no further than Pacific Watersports.